The Anchorage School District is considering changing school start times. What do you think? The Anchorage School District wants to know what the community thinks about changing school start times. Beginning on Wednesday, it's holding a series of open-house meetings about the potential changes. "The district is still very much in a listening mode," said Shannon Bingham, owner of the consulting firm hired by the district to study the start-time issue. The question is: Should the district shift high school students' school days so their classes start and end later? Science says yes. But it's not necessarily that easy. Making such a change has the potential to affect every Anchorage family with school-going children, as well as school staff, the city's child care providers and more. 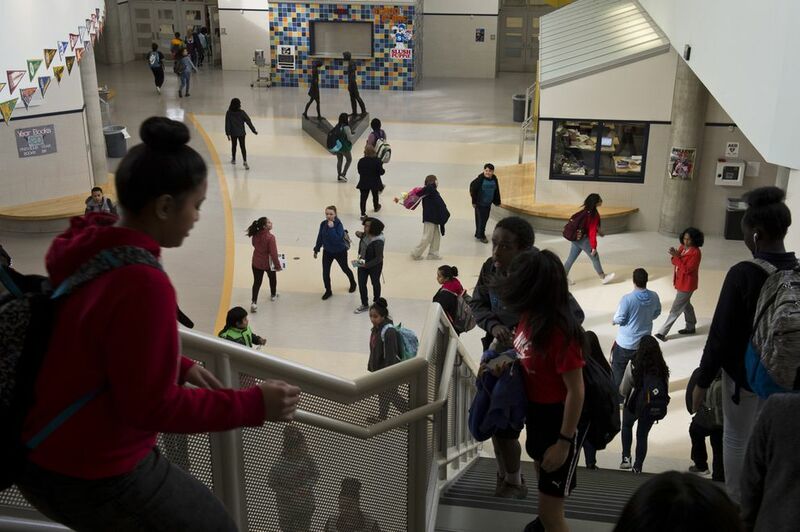 To change high school start times, the district would have to disrupt other students' schedules, too. There's a limited number of school buses, drivers and time, so school days must remain staggered in some way. 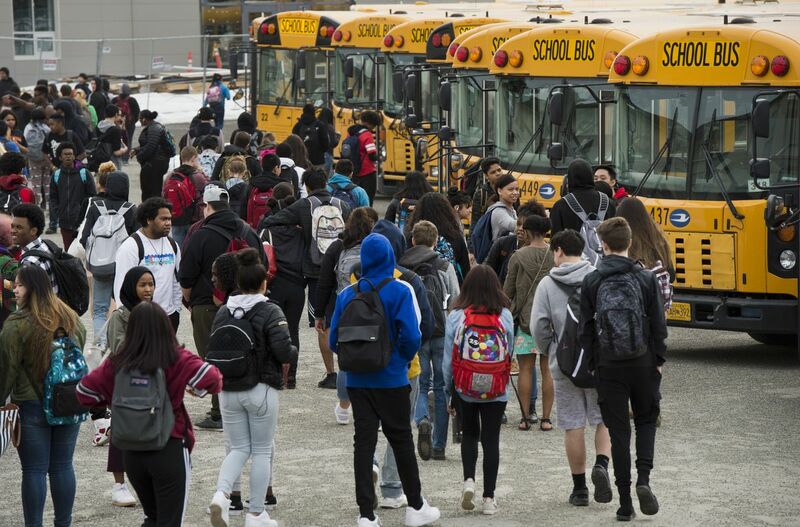 Right now, Anchorage high schools begin at 7:30 a.m., middle schools at 8:15 a.m. and most elementary schools at 9 a.m. The district has detailed three ways it could change those school schedules. The implementation of any change would begin in the 2019-20 school year. In all three possible scenarios, the district would shift high school start and end times to later in the day and move elementary school times earlier. In two of the options, it would have middle schools start later, too. A fourth option is no change at all, said Catherine Esary, school district spokeswoman. That's what the School Board decided in 2002, the last time the district studied school start times. The Board sided with then-Superintendent Carol Comeau, who said the district should continue researching the issue because there was no community consensus about what to do, according to an Anchorage Daily News article. Bingham, owner of the Colorado-based consulting firm Western Demographics, said school districts' interests in changing start times magnified six or eight years ago, largely in response to sleep research that said middle and high school students would benefit from starting school later. Historically, high-schoolers across the country have started classes earlier so they could get home to baby-sit younger siblings. The schedule also keeps elementary school students from walking to school or to bus stops in early-morning darkness much of the year, said Dr. Judy Owens, a professor of neurology at Harvard Medical School. "But it turns out, that's really just the opposite of the way it should be," said Owens, an advocate of making school start times later for older students. "The younger kids should be going to school earlier and the high school kids later," she said. "That's much more reflective of the circadian biology in both of those groups." Owens said younger children are more likely to naturally go to bed earlier and wake up earlier. Once children go through puberty, that sleep-wake cycle changes, she said. They get sleepy later. It's difficult for teenagers to fall asleep much before 11 p.m., she said. On average, those teens need between 8 1/2 and 10 hours of sleep, meaning 7:30 a.m. is not an ideal time for them to start school. Meanwhile, she said, "the younger kids are not starting school until 9 a.m. or 9:30 a.m. and they have been up for two hours or more at that point, and by the later dismissal times at the end of the day, they're wiped out." Changing school start times improves students' health and their academics, Owens said. Older students get more sleep, and younger students go to school when they're most awake. The American Academy of Sleep Medicine, the American Academy of Pediatrics, the Centers for Disease Control and Prevention and several other national organizations have recommended that middle and high schools start no earlier than 8:30 a.m.
School districts that have shifted start times later in secondary school and earlier in elementary school reported better grades, attendance rates and graduation rates, as well as fewer tardy students, according to information from the Anchorage School District. Students also experienced less depression, fewer car accidents, and fewer visits to health clinics because of fatigue, it said. Those are some of the pros of changing start times, Bingham said. The district and parents have also identified possible negative impacts. That includes less time for older students' after-school sports and jobs. Parents of elementary school students are also worried about their children having more days they must walk to school in the dark, Bingham said. Some high school students are expected to pick up their younger siblings from school, Bingham said. Other parents rely on after-school programs or daycare services. If elementary students are leaving school earlier, they will need more time in costly child care programs. "That's been one of the leading concerns during the focus groups," Bingham said. Bingham said the upcoming open-house meetings will give community members an opportunity to get information about what changing school schedules in Anchorage would look like. They can also talk to district employees one-on-one about their questions or concerns. Each event runs from 6:30 to 8 p.m. and people can come and go throughout the 90 minutes, Bingham said. There will also be surveys where people can select which of the three new schedule possibilities they like the most. Or, they can say they don't want a change. The surveys will inform the School Board's decision, Bingham said. The district has also posted a survey on its website. Bingham is expected to present the Board with a summary of the community's input in May. A Board decision will likely follow this summer or in the fall, Esary said. — Wednesday, April 11, 6:30-8 p.m.
Lake Hood Elementary School, 3601 W. 40th Ave.
— Thursday, April 12, 6:30-8 p.m.
Tyson Elementary School, 2801 Richmond Ave.
— Friday, April 13, 6:30-8 p.m.
— Tuesday, April 17, 6:30-8 p.m.
— Wednesday, April 25, 6:30-8 p.m.
— Thursday, April 26, 6:30-8 p.m.
Fairview Elementary School, 1327 Nelchina St.
*At the April 16 and April 27 events, translators in Spanish, Hmong, Samoan, Filipino and Korean will be available, as well as a sign language interpreter.